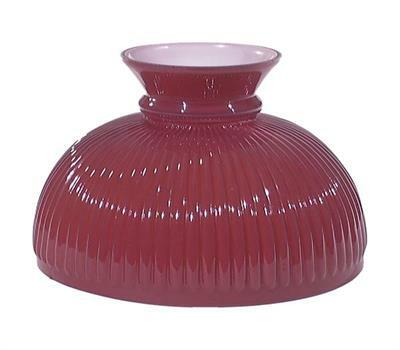 This Red Ribbed Shade features two layers of glass fused together for maximum light: Outer layer is ruby red, and the inner layer is opal white. Hand Blown Glass, Colors may vary slightly from shade to shade. Shade has a 10" base diameter and is 7 1/4" high. Top off a Brass Table Lamp with this Red Rib Shade for an elegant setting. For use with any 10" under-burner shade rings (sold separately). Ideal for use on Aladdin, Central Draft Style Antique Coal, Oil, or Kerosene table lamps with 10" shade support. Please Note: This Shade is Not made by Aladdin Lamps. 10" Fitter Size, Shade Ring Holders*, 2 1/8" I.D. designed to fit underneath (base/thread portion) ALADDIN Brand Burners & BP Lamp Supply Burners. Beautiful cased glass lamp shade. Outer layer is ruby red, and the inner layer is opal white.